Option Medium - 2" * 1.25" Large - 3" * 1.75"
The Golden Brass Meenakari Big Vati provided by us are artistically designed. These Meenakari Big Vati are made up of the best quality raw material and will definitely appeal you because of their elegance and durable finish. Graceful and Stylish Meenakari Vati is for Indian Festivals, Rituals and other functions. The product presents a good example of our culture and tradition. Which can be used in offering dry fruits, sweets and jaggery to god n goddess at the time of puja and also used in Diwali celebration. It has beautiful Minakari work which can be used for decoration, gifting, dryfruit or sweets etc in a royal way. 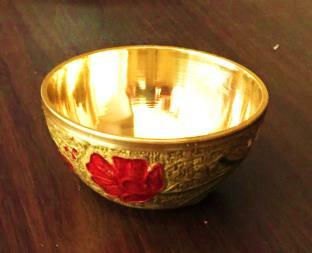 A beautiful Brass Meenakari Big Vati of Indian handicraft made up of pure finest brass. It has intricate Meenakari work which can be used as return gift on housewarming or wedding, temple decoration dry fruit or sweets etc in a royal way. This item in Metal Handicraft category was first added to our catalog on 04-24-2017. Buy Golden Brass Ethnic Meenakari Large & Medium Vati (Bowl), sold & shipped by Little India where you can shop online for Traditional Indian Gifts, Handicraft, Decor, Mandir & Murti. This Traditional Return Gift collection has been tagged as Traditional Return Gift, Bowls Vati, Vadki, Puja Samagri, Ritual, Bartan, Indian Festival, Traditional, Katori, Pooja Item. Antique Carved Design Oxygerman Return Gift Dry Fruit Small Box 7"X5"
Handcrafted Antique Finish Wooden Box w/ Lakshmi Ji Picture 2pcs 7X5"
Oxidized DryFruit / Mukhwas Dabba (Box) w/ Spoon - 6.5"